Young teacher, Rovshan Azizov, announces his resignation from work for calling for peace and friendship between Azerbaijani and Armenian children. He has been working as a teacher of the Russian language at school number 220 in the Nizami district of Baku since 2004. At the same time he always preferred non-traditional methods of teaching, using artistry and stage productions to increase the interest of children in classes. With the participation of children, he shot several videos dedicated to the friendship between Azerbaijanis and Armenians, contact.az. "I, as a teacher, want the Armenian and Azerbaijani children live in the spirit of friendship and love," Azizov said. The videos were played by the roles of Azerbaijani and Armenian children, who at first feuded, but realizing that they were friends. This idea of ​​Azizov caused protests of activists of the Karabakh Liberation Organization. "On December 20 they broke into the school and started insulting me, calling me a "traitor", and an "Armenian agent", demanding dismissal," Azizov continued. After 4 days he was fired from school, allegedly for violation of labor discipline, systematic late work. The teacher appealed against the order of the director and on March 14, the Nizami district court is expected to make a decision. "In fact, in the court director admitted that I was fired for what I said in the lessons about Armenians in the school without their permission. When I reminded that his own daughter took part in my video, he said that he thought the video was about peace between nations, but when he learnt that it was about the peace between the Armenians and Azerbaijanis, he changed his mind," said Azizov. Azizov noted that none of the parents expressed any objections to him. Parents and children still keep in touch with him. As for colleagues, they were forced to sign an appeal to the court against Azizov. Azeri activists held a protest rally March 14 outside the Azerbaijani Embassy in Washington D.C.. The activists were protesting against the dictatorial regime of Azeri President Ilham Aliyev, the Azerbaijani Azadliq news agency reported. “This is our first step, but this will continue. Our goal is to make our voices hear in Azerbaijan,” one of the activists said. The protesters were wearing masks and holding posters saying “Resist Aliyev”, “Freedom to the people of Azerbaijan”, “Same Dictator Different Century” “Protect Human Rights”. The activists also addressed the hundreds of political prisoners currently jailed in Azerbaijan, demanding Baku to immediately release them. The activists, who have fled Azerbaijan due to oppression, criticized the state-sanctioned pressures against their families back home and demanded the resignation of Aliyev’s government. “In addition of Ilgar Mamedov, Afghan Mukhtarli, Giyas Mamedov and Gyozal Bayramli, there are more than 200 political prisoners in Azerbaijan. As people living abroad who love their country, we too express our discontent and demand the release of all political prisoners [in Azerbaijan],” they said. Voice of America asked the protesters why they are wearing masks, and the activists said it is a precaution in order to protect their families in Azerbaijan. UK Prime Minister Theresa May said March 14 that the British intelligence will begin supervising and probing financial and business conduct of people suspected in corruption, Azerbaijani Adaqliq news agency reported. According to RFE/RL, the business activities of Azerbaijani President Ilham Aliyev’s family will be under secret investigation. New details are emerging over the corruption scandal involving Ilham Aliyev and his family. The scandal was dubbed Azerbaijani Laundromat and involved a 3 billion dollar secret account which the Azeri ruling elite used to bribe European politicians. Keep on dreaming, fake sultan! 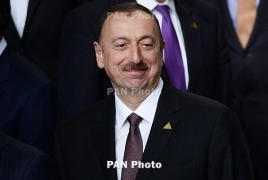 PanARMENIAN.Net - Azerbaijani president Ilham Aliyev on Monday, March 19 once again made territorial claims against Armenia. According to him, numerous books, maps confirm the aforesaid, while historical books allegedly reveal that at the beginning of the 19th century, the absolute majority of the Yerevan Khanate’s population, 80% in particular, were Azerbaijanis. Aliyev had on February 8 delivered threats against Armenia, claiming that "Yerevan Khanate and Zangezur are Azerbaijan’s historic lands." The Aliyev family - whose sons have ruled Azerbaijan for almost five decades - hail from a village in what is now enemy territory. High in Armenia’s mountains, near Azerbaijan’s Nakhchivan exclave, sits Tanahat, an abandoned village that was once home to Baku’s ruling elite. The Aliyev family – whose sons have ruled Azerbaijan for almost five decades – lived until at least 1921 in what was then called Jomartlou, a small village that in its prime in the early 1980s was home to 70 Azerbaijani families who toiled on the local collective farm. “He was born there,” Armen said, guiding the jeep through the dirt and snow of the mountain pass. “His family changed his date of birth.” The reason, he thinks, was that it would be politically unpalatable for a senior Azerbaijani leader to have been born in Armenia. Heydar Aliyev, first secretary of the Communist Party of Azerbaijan from 1969-1982, and then president of independent Azerbaijan from 1993-2003, may well have been born in Jomartlouin 1921. According to his official biography – as recorded by the Heydar Aliyev Foundation, a charity founded in 2004 and headed by Azerbaijani Vice President Mehriban Aliyeva, Heydar's daughter-in-law – the former president was born in Nakhchivan on May 10, 1923, shortly after his family moved there from Jomartlou following the Soviet occupation of the Caucasus. The Great Soviet Encyclopedia corroborates that account. But many contend that Heydar was in fact born here. “Rumors have long circulated that Aliyev was in fact born two years earlier, but that it was decided that a senior Azerbaijani politician should not have an Armenian place of birth,” wrote longtime Caucasus expert Tom de Waal, on the occasion of Aliyev's death in 2003. Curiously, after this reporter visited the village and tweeted about it, a number of Azerbaijani news websites published identical stories that said the Aliyevs didn't move out until 1925, when Heydar was two. Despite its small population, Jomartlou boasted a regular bus service connecting it to Baku in the 1970s – a service founded at the behest of Heydar Aliyev, then a high-ranking Soviet official. After the collapse of the Soviet Union and Armenia's independence, Jomartlou's fortunes fell. Its Azerbaijani inhabitants fled at the onset of the ethnic conflict in 1988 and it was later resettled by Armenian refugees, but most of them didn't stay long. The village was renamed Tanahat, after a nearby Armenian monastery, in 1995 as its Azerbaijani past was airbrushed from Armenian history. Looking around, it’s not hard to see why he reached this conclusion. Almost all the houses dotting the hill are decrepit and long ago collapsed. The only signs of recent life are the occasional empty vodka bottle, indicating at least a few locals are returning to drink, if nothing else. And the road connecting the village with the world is simply a dirt track on the side of a mountain, impassable in winter. In the post-Soviet period, villagers argued that the authorities neglected them. One of the most persistent issues was the lack of a regular bus service, which meant locals had to walk five miles – over an hour – to the neighboring village of Tasik to get a bus to Sisian, the largest town in the area. Without such a service, local children could not attend school, and families would move to neighboring towns instead. Only three families lived here in 2014. Today, there are none. But the village may attract an unusual segment of the regional tourist population. “You know, it isn’t uncommon for Azerbaijanis to cross the military border at Nakhchivan and travel here in secret,” Armen says, repeating a widely held belief in the region. The Armenian Border Guard did not respond to requests for comment. Heydar Aliyev ruled neighboring Azerbaijan with an iron fist from 1969 to 2003, with a brief interruption in 1987 following Soviet leader Mikhail Gorbachev’s anti-corruption campaign. Aliyev was one of the campaign’s first victims, but returned to power in 1993 following the independent state’s near descent into civil war. When he died in 2003, he was succeeded by his son, Ilham, who remains president today. Ilham is running, with no serious opposition, in elections next month for a new seven-year term in office. The senior Aliyev’s legacy remains mixed in Armenia. He was the head of the enemy state, and it was under his leadership that the Karabakh conflict entered its bloodiest phase. But compared to today's leadership under Ilham, Heydar is remembered as relatively diplomatic and open to peace with Armenia. Whatever the case, Jomartlou/Tanahat today languishes in abandonment and obscurity. “You are the first visitors I’ve ever taken here,” Armen said with a smile. PanARMENIAN.Net - When making territorial claims against Armenia for the second time in the past month, Azerbaijani president Ilham Aliyev was standing on the spot where once an Armenian church used to rise. 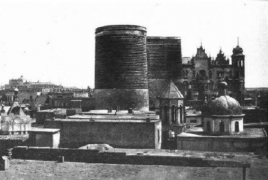 It is noteworthy that Aliyev was standing in front of the Maiden Tower where the Armenian church of the Holy Virgin was standing up until 1990, blogger, journalist Sedrak Mkrtchyan said in a tweet. The church was built in 1797 or 1799 at the foot of the Maiden Tower, a fortress in Baku. According to a diplomat working in the Azerbaijani capital in 1992, the church was demolished in the wake of the Nagorno Karabakh conflict. Now, there is an empty space at its former site near the Maiden Tower. 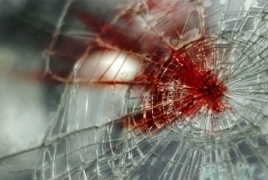 PanARMENIAN.Net - A gunman shot and gravely wounded an exiled Azeri journalist and killed his wife near the southern French city of Toulouse on Friday, March 30, in an incident the local mayor said appeared to be a settling of political scores, Reuters reports. “It’s the journalistic profession, the father of a family and the freedom of the press that has been attacked today,” Karine Michelet-Traval, the mayor of Colomiers where the shooting occurred, said in a statement. RULE ONE of the Dictator’s Handbook: Allow no one else to seriously challenge you in an election. Rule Two: Spend enough of your nation’s treasure to lure a popular Western entertainer to distract from Rule One. Previously, President Ilham Aliyev, son of a strongman who inherited his father’s distaste for democracy, enticed Lady Gaga to perform, then Mariah Carey. Now Mr. Aliyev has booked pop star Christina Aguilera for the Formula 1 Azerbaijan Grand Prix on April 28. That will be just 2½ weeks after Wednesday’s presidential election. Mr. Aliyev has so thoroughly suffocated democracy in Azerbaijan that he will certainly win a fourth term by a wide margin. The campaign is entirely uncompetitive. Two opposition parties are calling for a boycott. Mr. Aliyev moved up the election date by six months, perhaps in order to get it out of the way before the auto race, which presumably will be more competitive than the political one. Mr. Aliyev has never hesitated to spend lavishly to dress up his shoddy reputation. Last year he gave away hundreds of free apartments to Azerbaijani journalists; one leading editor said it was akin to a bribe. The Organized Crime and Corruption Reporting Project, a consortium of news organizations, in a report titled “The Azerbaijani Laundromat,”documented how Mr. Aliyev and others in the Azerbaijani elite used overseas shell companies to hide “a secret slush fund to pay off European politicians, buy luxury goods, launder money, and otherwise benefit themselves.” Then there was the bacchanal sponsored by Azerbaijan’s state-owned oil company, an all-expenses-paid trip to a conference in Baku for 10 members of the U.S. Congress and 32 staff members, who received silk scarves, crystal tea sets and Azerbaijani rugs. If Ms. Aguilera has time, she may want to poke around Azerbaijan’s jails. According to the Committee to Protect Journalists, Azerbaijan ranks among the worst jailers of journalists in the world, with at least 10 imprisoned when its last survey was completed in December. She might also want to set aside some time to get a reality check on Azerbaijan from Khadija Ismayilova, a courageous journalist who endured a prison term for the “crime” of her hard-hitting investigative reports about Mr. Aliyev’s family wealth. Or, perhaps Ms. Aguilera could visit Ilgar Mammadov, a prominent alternative voice to Mr. Aliyev who was arrestedmore than five years ago shortly after announcing he would challenge the president in the 2013 elections. Mr. Mammadov was accused of inciting violence and sentenced to seven years in prison after a faulty trial. The European Court of Human Rights found his detention illegal. He is still locked away. 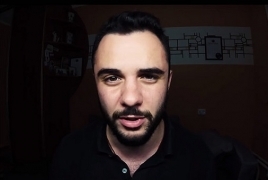 PanARMENIAN.Net - A Belarusian blogger with Armenian roots, Vladislav Mosesov, commonly known as Vlad Maga, announced in a video message that Azerbaijan has started a persecution against him after he visited the country. “Yesterday Azerbaijan declared me wanted. I have already left my country, but I can’t reveal where I’m going for security reasons,” the blogger said. He added that if he fails to reach out 3 days after the video message, something bad has happened to him. Earlier, Russian-Israeli blogger Alexander Lapshin revealed that Vlad had managed to travel to Azerbaijan and find the house in Ganja (Kirovabad) which belonged to his parents before they fled the Armenian pogroms. After visiting Azerbaijan, the blogger went to Armenia and Karabakh. Threats against him began after he published a video about his trip to Azerbaijan. people are looking for him. he should move to Armenia Artsax noone will fine him ther. The fake sultan of azveristan is at it again, barking incessantly. How many years of barking would that be? Who cares let him bark! Marianna Mkrtchyan. Azerbaijani President Ilham Aliyev again spoke about any means for the settlement of the Nagorno-Karabakh conflict. Thus, Aliyev, at a meeting with representatives of the public and artists from the Agdam region, once again assured that Azerbaijan from a military point of view is a powerful state not only in comparison with Armenia, but also on a global scale. He pointed to the intention to further build up military power, expressing the conviction that this is one of the most important factors for negotiations. "Unfortunately, the norms of international law are completely ignored. We will achieve what we want. We demand justice. We demand that our historical lands be freed from invaders, and they will be freed. The Azerbaijani state will continue to take all necessary measures to achieve this sacred goal. I hope that the leadership of Armenia, having correctly analyzed the situation in the region, will soon withdraw its occupying forces. Otherwise, any option is possible and we are ready to any scenario", Aliyev said. At the same time, he tried to raise the moral and psychological spirit of his own society by praising the events of April 2016, when the armed forces of Azerbaijan launched a large-scale military aggression against Artsakh. Aliyev said that the April battles are the glorious history of Azerbaijan, a great historical victory. At the same time, he assured that in the course of these events, tens of thousands of hectares of territories were liberated. "The April battles are our big victory, a manifestation of the irreconcilable spirit of Azerbaijan. At the same time, he assured that it was in April 2016 that a "Armenia'3 regime "was dealt a powerful blow." I have repeatedly said that the regime of Armenia the criminal junta should be condemned by the entire global community. I said that people who govern Armenia are the leaders of the regime of the criminal junta. Now the Armenian people themselves state this. That is, at present, the Armenian people speak and see everything that we talked about. The changes that have taken place in Armenia this year mean the complete collapse of their aggressive policy, this is first. Secondly, these events indicate that our policy gives results. I have repeatedly said, I want to say today, there is no need to hide it, we will further isolate Armenia from all regional projects, using all means, restore our territorial integrity. The new leadership of Armenia should not repeat the mistakes of the former criminal regime, it should soon through negotiations withdraw the occupying forces and allow the citizens of Azerbaijan to return to their native, historical, ancestral lands. The sooner they understand this, the better it will be for them, for the region. Once again I want to say that we do not intend to put up with such a situation, the norms of international law fully support our position, historical justice is on our side, "Aliyev once again tried to convince his people. At the same time, the leader of the state with just a century-long history spoke about the age-old centuries- old belonging of Nagorno-Karabakh to Azerbaijan. At the same time, he tried to justify that allegedly, as a result of the chaos, the events that occurred in Azerbaijan in the early 1990s, Armenia, with external support, allegedly managed to conquer some of the Azerbaijani lands, while not mentioning that during these times Karabakh people fought for its existence and independence, and was able to avoid complete extermination. "But two years ago we demonstrated that we could liberate and liberated our lands by military means. As a result of a successful operation we carried out this year in the Nakhijevan direction of the Armenian-Azerbaijani border, more than ten thousand hectares of land passed under our control, including heights of strategic importance. Today we fully control strategic communications, roads, including roads in Armenia, communications leading to Nagorno-Karabakh, "Aliyev said. apartments in London for $76 million using a secret offshore company. according to The Guardian’s reporter Luke Harding. to manage their multi-million dollar property portfolio in Britain. exclusive neighborhood in the Czech spa town of Karlovy Vary. In 2005, the control of UF Universe Foundation changed hands. Pres. of the two sisters, Exaltation Limited, a British Virgin Islands firm. money-laundering checks and breaching his professional code. their ownership was exposed,” according to The Guardian.